Make envelopes in minutes with this award-winning scoring tool. Add the finishing touches to your card creations by packaging them in matching envelopes! This board can transform any sheet of A4 or A3 paper into beautiful envelopes in over nine different sizes to match all your card sizes and mini envelopes for decoration. Pack includes board and scoring tool. The all-in-one, compact carry-case which allows you to score, measure, trim, embellish, and create boxes, shaped card blanks, envelopes and so much more. Made in UK. Ten functions in one case! Card-making - fold perfect cards with this card-scoring facility. Box maker - Make boxes in any shape or size. Your box and lid will fit together perfectly, regardless of the style you choose. Popout & K-card creator - You can create a whole host of popout cards in various shapes and sizes. Decorative embossing - A selection of designs to dry emboss into your card and box projects. Paper trimmer - Handy built-in paper trimmer! Measurements are marked in inches and centimeters for reference. Storage compartments - The storage compartments allow you to store all your accessories. Envelope-making - Make standard and three-dimensional envelopes. You can make envelopes in over 12 different styles and shapes. Bow maker - The peg system will allow you to make bows in various sizes using all types of ribbon in seconds. 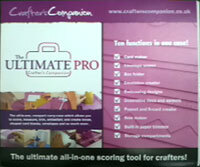 The Crafter’s Companion Top Score Multiboard caters to all of your card and box making needs. With the capability to make over 15 different cards, and every shape and size box imaginable, this really is the ultimate scoring tool for crafters! Create perfect cards every time! Board has straight, wave and scallop lines for embossing. The set consists of board and scoring tool.